A number of stabbings and migrant crimes prompted the town council in the German city of Cottbus to vote to ban more migrants from living in the city. The video below is an excerpt of one of the speeches. Rick, that rumour was going around as one of the possibilities from the very beginning. It certainly fits, explains the ‘other’ person, and maybe a few other things. We deserve the truth and have to find a way to get it or they will continue to use this and other cases, including manufactured ones to beat us into submission for Islam. If the demonstrations of the past few days are any indication, the insult would be felt hard. He is insulting us by going ahead with the charade without releasing any details of the investigation. How can we not suspect he is holding back damning information(for his agenda) when he has lied to us before, jumping the gun and trying to make Canadian’s look bad. We are being framed, All Canadians are being framed by our Government. Tammie Putinski-Zandbelt commented 2018-01-27: “Six people gunned down in a mosque is truly shocking, and abhorrent. What has been reported since the very beginning is very suspect. The court process with Andre Bissonnette is very unusual.” Indeed! There is scant information as this has nothing to do with “Islamophobia”. Some fairly reliable and confidential sources have pointed out the accused was in a gay relationship with a Muslim at the Mosque. The Muslim, terrified of being cast from the family as well as being executed for the “crime” of being gay, broke off the relationship and went full Islam again. The accused, being “In Love” or so was presumed, reacted badly. Jihadi Justin and the media do not want any one to know this as it will destroy the “Islamophobia” narrative which the Lieberals are counting on to get their Sharia blasphemy law into place. M 103 was never about protecting any groups, Muslim or otherwise. It is about the “quelling” of free speech allowing Jihadi Justin to declare a dictatorship, possibly before the next “election”! Bravo Zulu… Trudeau won’t be elected for a second term he will be appointed behind the scenes because the fix is already in. It doesn’t matter who votes it only matters who counts the votes. 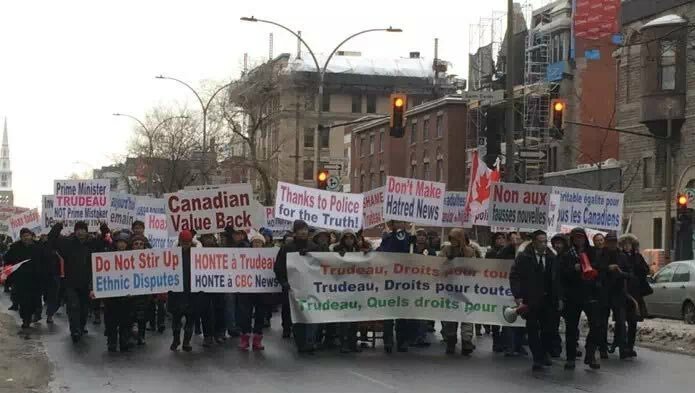 March today and tomorrow with Canadians for Canadians against Justin’s divisive actions. But will any of Trudeau’s actin matter at election time? A lot of Canadians are as stupid as he is. I predict the POS will be re-elected – hope I am wrong, suspect I am right. Canadians are becoming as a whole – a country not worth spit. Still some good ones out there but now when I travel I stay away from them – they are socialist trouble and little more. The coverage has already started on the one year anniversary of the Quebec mosque shooting….it will be wall to wall coverage with very little information. The focus will be “Canada’s Islamophobia problem”. I will post links segments from Little Grey Cells tomorrow….he hasn’t uploaded anything recently, but, he has a series of very interesting videos. Six people gunned down in a mosque is truly shocking, and abhorrent. What has been reported since the very beginning is very suspect. The court process with Andre Bissonnette is very unusual. If a protest comes to Ottawa, I will be there. As soon as it happened, I emailed both Justin and Scheer to ask them when Canadians could expect their apology. No response of course. Justin thinks this will pass without comment. Scheer is following Justin’s lead. We can’t let it pass. Tammie it is good isn’t it, to see Canadians starting to stand up for themselves. 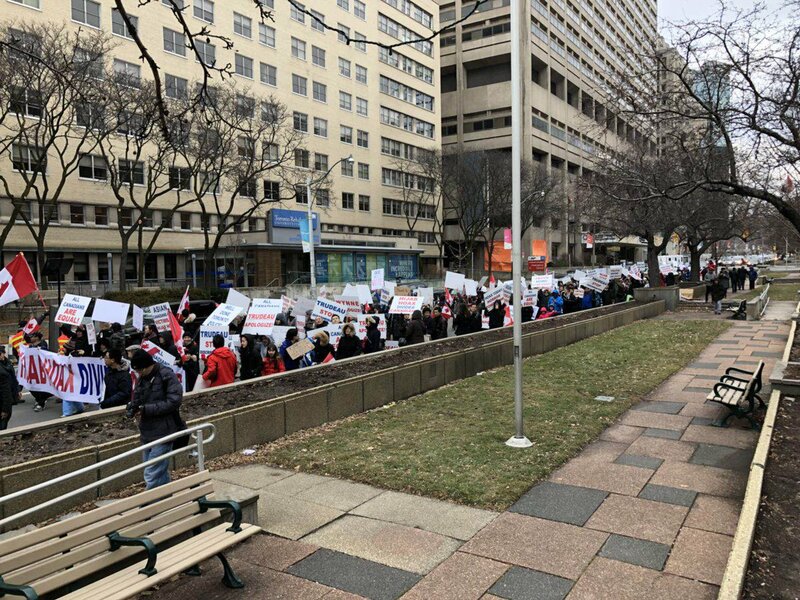 Drew, James fails to realize Trudeau has BIGLY pissed off Asian voters & many others in this country – Hijab Hoax protests are spreading, started last weekend! Trudeau brought this on himself with his ridiculous tweets and refusal to apologize for them. Butts will now instruct him to call these protests a symptom of Islamophobia….which will only make matters worse for the LPC. When Parliament resumes, there should be a mass protest on the Hill! The sound of crickets = msm counting on their corporate welfare cheque to stay silent. More cities need to say NO, absolutely NOT to Merkel! Germany finally rebelling against Merkel? Since 9/11 – IN THE NAME OF ISLAM (SATAN): 34,683 Attacks, 225,665 Killed, 305,113 Injured that we know of.